Versatile - use in dips, salads, sandwiches etc. My creativity shines with versatile and reliable ingredients. Lady's Choice Real Mayonnaise is a versatile base that helps create variety of dips to make an exciting and unique dining experience. All food additives are of plant and synthetic origin. May contains traces of cereals containing gluten, soy, fish and milk. 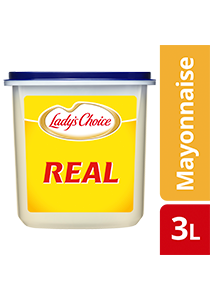 Lady’s Choice Real is your preferred mayonnaise that delivers a delicious balanced taste, with the right creamy texture and consistency. Made with real pasteurised eggs, vinegar and soybean oil, it’s ideal for various applications such as a base for elaborated cold sauces, salad dressings, sandwich spreads and dips. Lady’s Choice Real, the superior choice for your recipes! Malaysia's Most Preferred Mayonnaise Brand. Contains Omega 3. Keep in a cool & dry place. After opening, keep refrigerated at 4–10℃. Do not freeze. 23 92 Points TOP SELLER! 19 76 Points TOP SELLER!